Great looking, and it has my model in it. What’s not to love? As I mentioned previously, I was very, very excited for this game’s release. Now that it’s out I’d like to offer a short review to go with my companion piece, in which I discuss my own Knight and how she got into the game. Of course, that should make my positive bias towards this game pretty clear. First up, I’d like to do a quick rundown of typical gameplay in Warhammer 40,000: Freeblade. 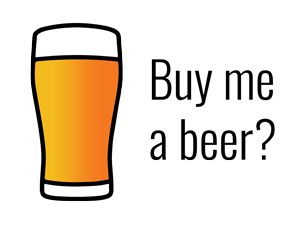 This is bred from the ground up as a fairly casual mobile game. It’s an on-rails shooter, based around the mechanic of simply pointing your finger at the items you want dead. On the iPhone 6S, which has 3D-Touch (basically a pressure-sensitive screen), how hard you press changes the way you activate your weapons. On other devices, you simply use multiple fingers. The one advantage the 3D Touch has is a controllable zoom whilst using your Heavy Stubber or Melta. It can de handy for little tiny orks hiding behind cover. 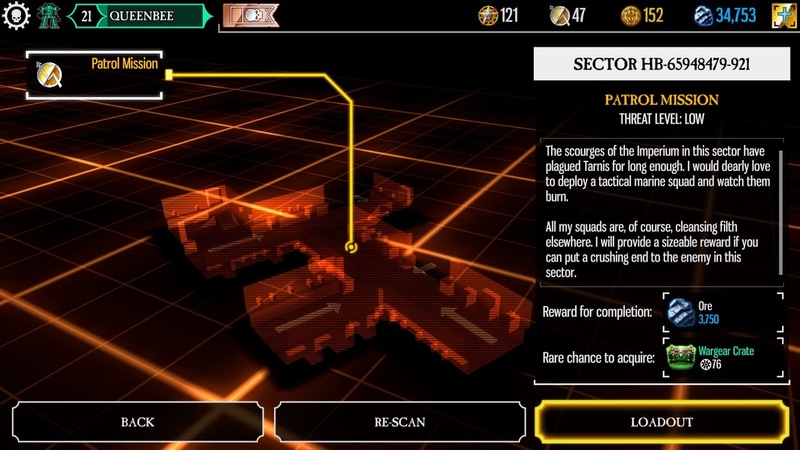 The levels themselves are focused, with a simple story layered in and a loot system to give you something to do between missions. I love the short missions. Each of them takes less than 5 minutes from start to finish. You begin the level with a head-on view of your Imperial Knight, resplendent in the livery or paint scheme you’ve chosen, and then the camera turns around to reveal streams of cute little orks or renegade marines pouring out into the streets to toss small arms fire at you. 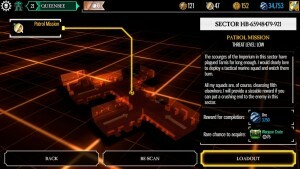 The levels add new adversaries from time to time, ramping up the threat to keep pace with your big guns. 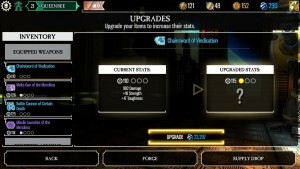 Depending how much time (and money, more on that as well) you throw into grinding your power level up, the threats seem well-balanced between offering a significant challenge without being so tough they turn you off. 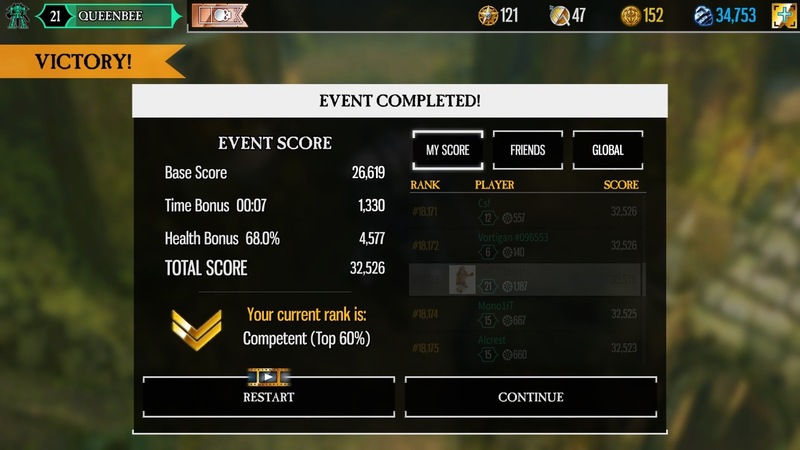 The results screen tells you where you stand in global results. The better your rank, the better the rewards! 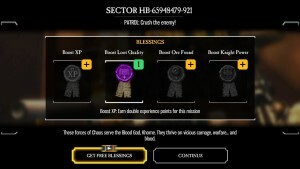 There are also several types of missions, from Story missions to Patrols to Daily Events (if you’re connected to the internet). They all play roughly the same, but you get to test drive famous Freeblades in Daily Events, some of which have much better equipment than you. It’s nice to try out different play styles and rank yourself against others. You get tons of loot from these missions, based on your performance tier. 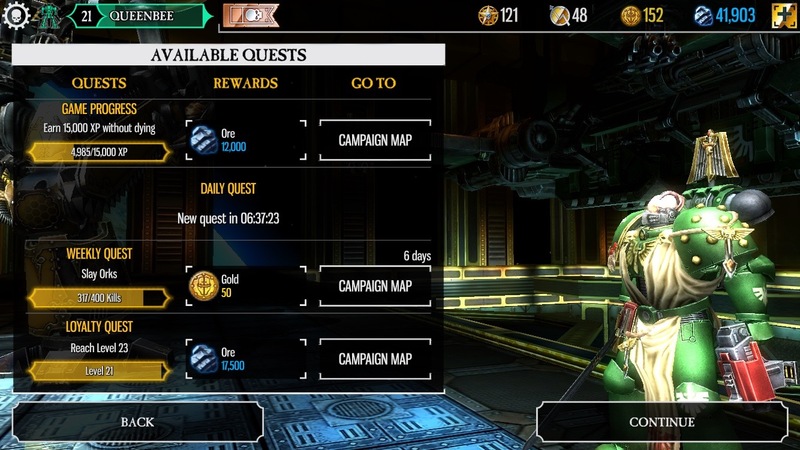 Story missions are just that, and they’re divided into chapters. 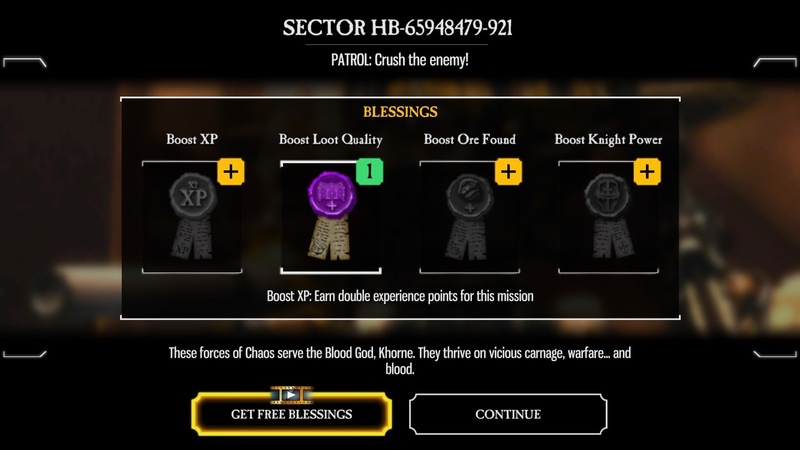 Before each mission you have the option to use boosts in the form of Purity Seals. Actually, I’m not sure how to remove them. If they’re in your inventory I think they get used automatically. Anyone know if I can turn that off? Patrols are very similar, but they refresh every couple hours so you can use them to grind for Ore or Experience between story missions. 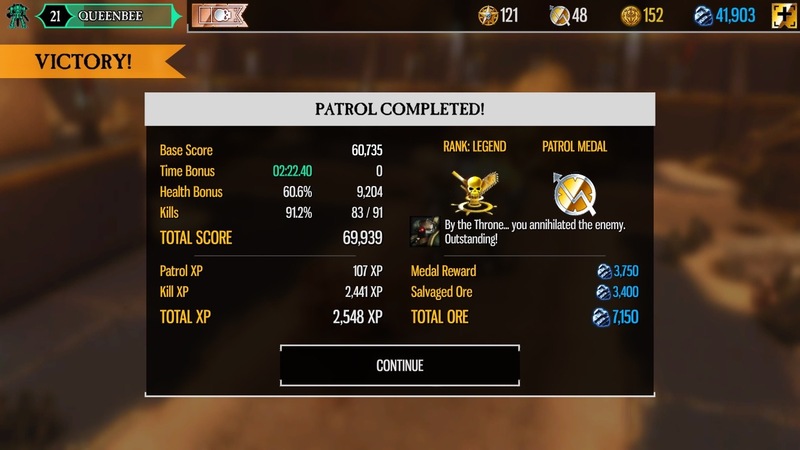 Patrols are great for earning XP and Ore.
As your Knight stalks the abandoned streets of the hives and manufactorums, you’re constantly on the look-out for new threat vectors when the viewpoint swivels around. There’s no shortage of destructible items in the environment, and they can be destroyed to keep your score multiplier from decaying between waves of enemies. There are also times where you can see groups of enemies coming before you can take them down, or even watch as groups of heavy armor amass in short cutscenes before the controls allow you to start blasting away. 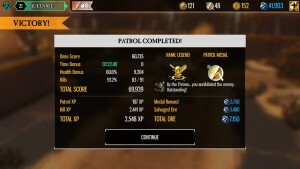 The sense of pacing keeps the action to the fore, and then when the mission is over you collect loot, experience, and materials with which to upgrade your Knight. You’re also ranked, based on your score. I found that with these short missions, I actually wanted to go back and earn more medals in the story missions (indeed, you may need to in order to unlock the next chapter of the story sometimes) or get a better rank in patrols the next time around. I rarely feel that way in any game. Of course, you can always buy Gold and Ore with hard-earned cash. 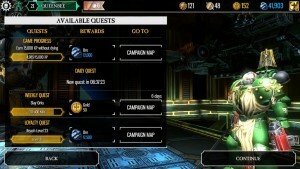 There are two major currencies in the game, as seems to be the case with many of these free-to-play mobile games. 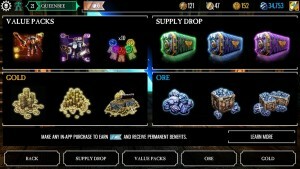 The first and most plentiful currency, Ore, is used to build and upgrade your wargear. This is an essential mechanic that makes sure you’re ready to take on the higher levels of the game. 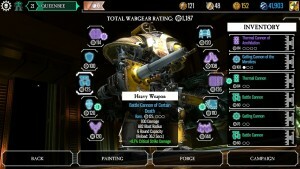 There’s a straight-up lock on Wargear ratings, so you can’t initiate a mission without matching or exceeding the numbers. 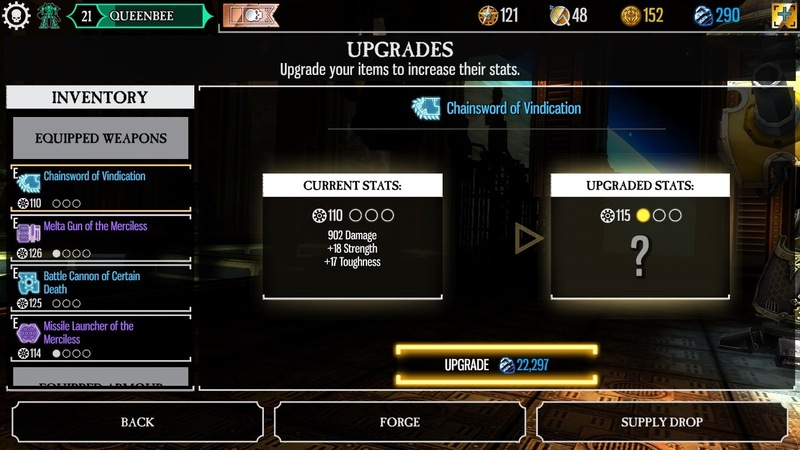 The game makes it really easy to tell what parts are out of compliance, and offers suggestions to either upgrade an existing item or forge a new one. The game throws a lot of ore your way, which is good because you need a lot of it to get the most out of kitting your noble mount to the gills. There are times where it feels a bit tight, but on balance I think these levels are spot on. You don’t get so much that you feel it has no value, but it’s not so stingy that you feel like you want to shell out real money for it. Your tasks are given to you by the Unforgiven, apparently. Your Freeblade is an Oathsworn ally to the Dark Angels. Supply Drops are the only way to unlock certain things, like new paint colors. The other currency is Gold, and it’s used to speed things up so you can pay to keep playing beyond the soft limits in the game, and to unlock a lot of cosmetic items. You get it through doing well in missions and hitting tasks (like “kill 1,000 Orks” or “forge a new Stubber), amongst other things. I was saving gold up like crazy in order to purchase my Queen Bee skin, but to my surprise she was a free upgrade when I hit Level 15, so I had several hundred Gold saved up. 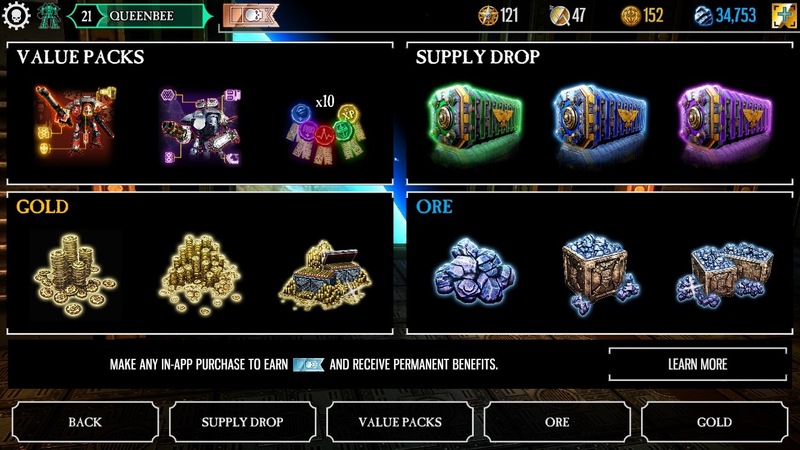 You can use all the extra gold you’ll have sitting around to do things like purchase ‘Supply Drops, which contain Ore, rare loot, Revives, and lots of customization options and colors. 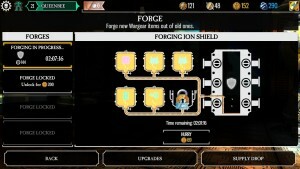 Gold can be used to all kinds of things, such as replaying a level and speeding up production in the Forge. Out of the two currencies, clearly it’s gold that you’re more likely to pay real money for, so they can push past the limits in the game. I love the green chassis icon inside the outline. I heard the term “Fun Pain” used to describe the ‘control’ in some games that limits your playtime or holds you back in some way. These are added to free-to-play games because frankly some people will pay real money to pass these walls and keep playing. This allows others who are more casual to simply wait an hour or two. In Freeblade, the Fun Pain comes primarily from your Structural Integrity. As you fight battles, your Knight’s chassis will degrade. You’ve only on one Sacristan, and that poor little guy has to spend a long time building it back up between missions. Sometimes this can take hours. Some missions include wargear requirements to boot. Forging new weapons is the best way to clear out old, outdated equipment. At a certain point in the game you need to start finding or building up better equipment to keep up with your enemies. 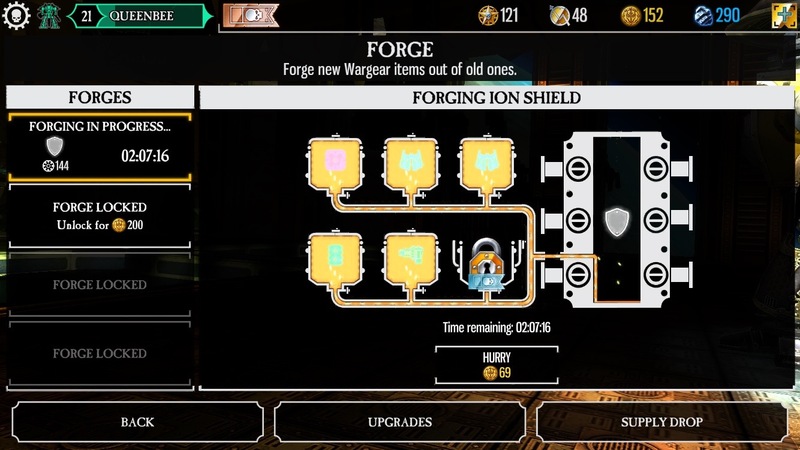 The first time you run into it, it’s easy enough to upgrade an item or two with your saved-up Ore, but after a while you need to make sure you’re always creating something in the Forge to keep up. It’s a nice mechanic, to be honest. If you choose to pay, you can speed up production or even purchase upgrade packs from the store with vastly stronger loadouts. I purchased one early on that made my initial progress much smoother, but I’ve since grown out of those items. You can watch a commercial for an easy boost, but these are also earned as bonuses all the time. A controversial mechanic in this game is the option to watch commercials instead of spending in-game currency. I personally really like it, because it’s 100% optional and I don’t mind watching them. You can score free ore, get an extra try at a free daily item, speed up your chassis repair or even get a do-over or boost for missions. I’ve seen some folks complain about them online but they’re completely optional. That middle tier is worth it, if just for the better repair speed. This is cool. 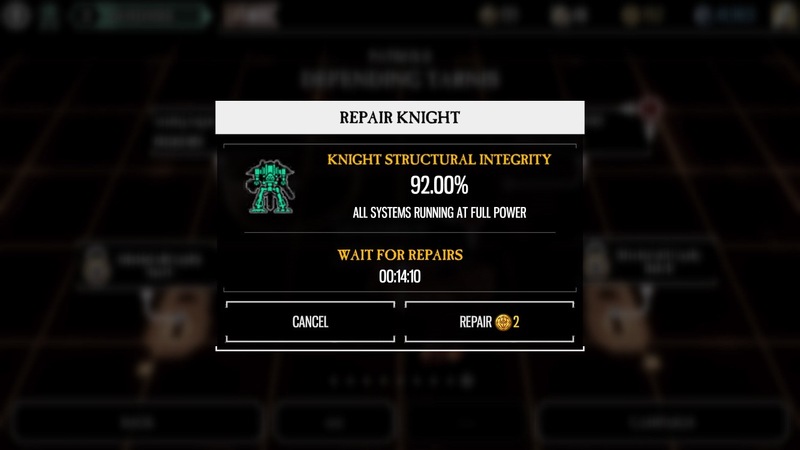 I suspect some people spend real cash and literal hours messing around with their Knight, if checking them out in the Leaderboards is any indication. Not only can you equip tons of different weapon options (many of which look different), you can adjust colors, patterns, and badges to make something truly unique. 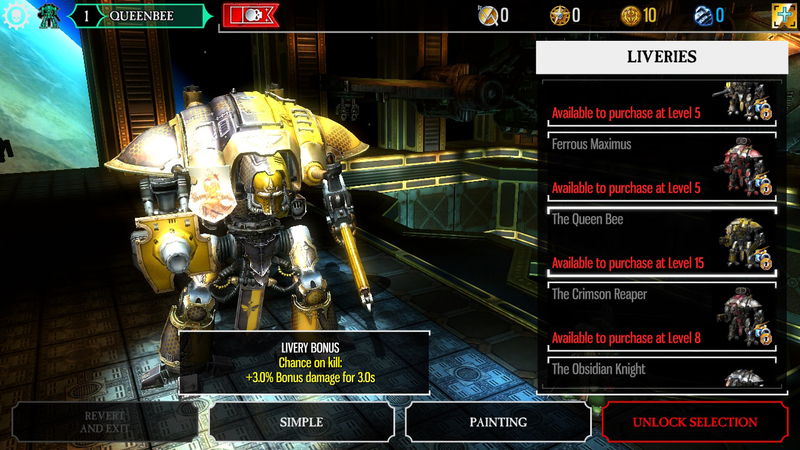 There are also a number of set Liveries to match famous Freeblades like Gerantious, the Obsidian Knight, White Warden and even fan favorites like my Queen Bee. You can even find liveries to match the major Knight Households like House Terryn, House Raven, House Hawkshroud, House Taranis and lots more. I think all the big names are in this one. The basic model is the same for all, so don’t expect to add a cog to Adeptus Mechanicus-aligned houses, but the colors are lots of fun. Customizing the paint is a great way to get some nice angles on your Knight as well. Every color in the game is named after a Citadel Colour from the paint range. It’s a nice touch, and allows for very accurate reproductions of your table-top models. On top of that you can decide how the heraldry is displayed (quartered, halved, etc.) to match the most common arrangements straight from Codex: Imperial Knights. You can add hazard stripes on the carapace, cog symbols, etc. Then there’s the option to add special badges over the top, in the fashion of many Freeblade Knights with their own personal heraldry. 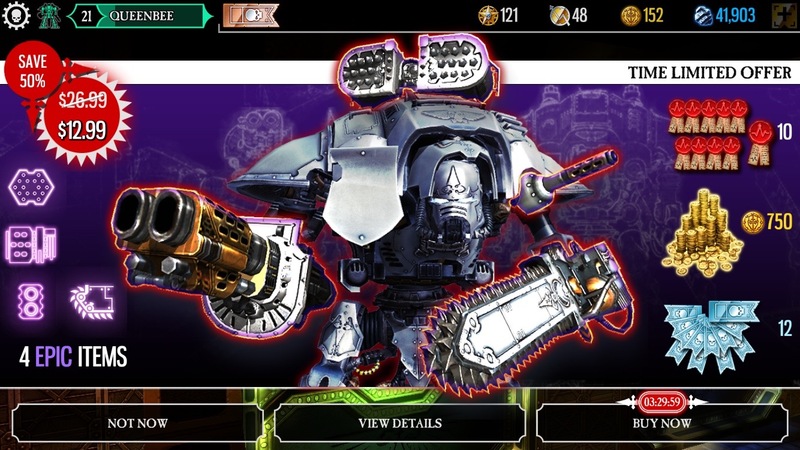 In an ironic twist, the official Freeblade scheme created for the game is actually livery for an Imperial-aligned house, right down to an Aquila allegiance symbol on the carapace instead of the expected Freeblade skull-and-laurel design. This is intentional, and gels with the story of the game. 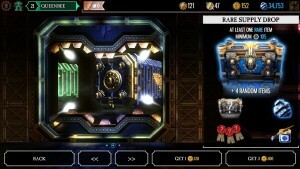 Many of the colors and badges cost in-game currency to unlock, and some are even special items that can only be purchased in a package from the store. Again, all of that is totally optional but some seem happy to pay for the privilege. Upgrade or Forge a new item? They both have their uses. 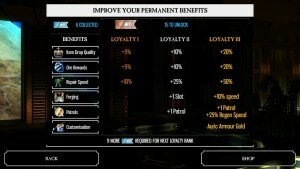 As you find or forge new items you’ll be able to replace your weapons with all kinds of options. 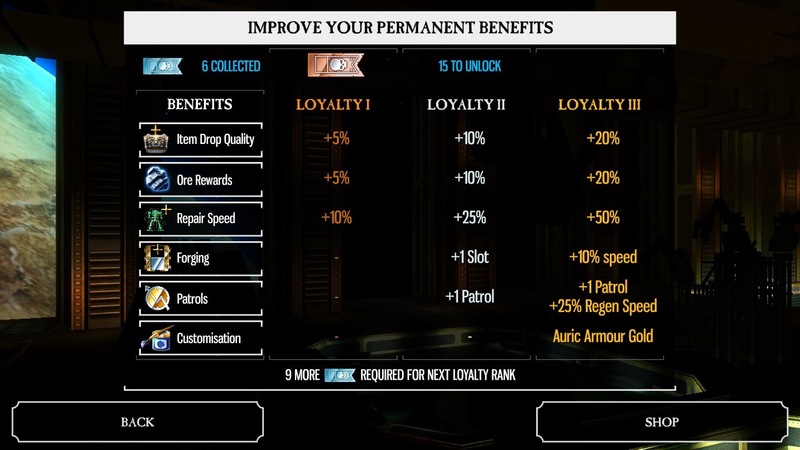 The game is so generous that before long you’ll be swimming in parts, most of which you won’t use. This is good, because you can break them down for Ore or use them to Forge entirely new weapons. Pixel Toys has done a great job making a lot of different weapon meshes and expanding on the original designs of the model. You’ll see short and fat Battle Cannons as well as beefy double-barrel ones. Some Thermal Cannons are sleek and deadly, while others are wide-mouthed beasts. 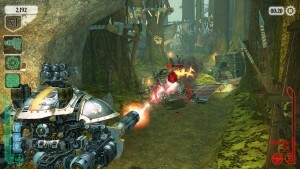 At higher levels, the Gatling Blasters go from a few barrels to lead-tossing behemoths, complete with armored plating. The same goes for the Reaper Chainsword and all three carapace weapons. There are also options for Stubbers and Melta Guns, but I think they all look the same. You’ll end up with buckets of extra weapons laying around. Why not break them down or use them to Forge something new? These options drastically change not only the look, but the play style you prefer. Want to run a Melta Gun to take out armor, while you reserve the wide-blasting Battle Cannon for armor and take out fliers with an Autocannon on your shoulders? No problem. Feel like blasting tanks and Squiggoths into slag with a Thermal Cannon? Make sure you bring a Stubber to deal with infantry and you’re golden. Each option looks badass in its own right. It’s actually fun to unlock some powerful new wargear and try it out to see how it looks on your Knight. This view never gets old. Feels so good to blast some fools. This game looks hot. I love it. As you can see from the screenshots, a great deal of care and attention was placed on the look and feel. I love the way the Knights move, stomping around with a sense of weight. There are times your upper body will turn 90 degrees while you keep walking forward, and once in a while you’ll even walk backward! It’s great fun and I think they really nailed the sort of look I had imagined for my own Knight when I was putting together the kit. The environments offer a nice sense of scale and scope, from ironclad Imperial streets to jungles with ramshackle Ork villages in the trees. The UI during missions even has neat little touches that are hard to notice while you play. In this screenshot you can see a health meter for the Deff Dredd, but note the baroque flourishes? They match some of the scrollwork from the Imperial Knight decal (or transfer) sheets in the kit. How cool is that? Everything seems very intuitive, and the controls never seem to get in the way. There’s something about the solid ker-chunk of a Battle Cannon’s autoloaders that just screams 40K to me. The rattling metal stomps, throaty brrrrrrt of the Gatling Cannon… All of it is very evocative and spot-on to my expectations. The fact that I usually listen to this on my iPhone speakers makes it all sound a bit tinny, but when I stream it to my TV and sound system it sounds fantastic. I love hearing the Waaagh! of the Orks and the thmp of my stubber tearing them apart. It’s a rich sound environment. On top of that, I really like the sound track. its’ available on iTunes and I’ve been listening to it off and on while I work. Top notch on the sound front, as far as I’m concerned. I will never think of the Battle Cannon in any other way now, having heard that reload sound. Man, they’re pulling out all the stops with these sales. They’re a bit of an eyesore, but worth a good chuckle. Beware mindful of your wallet, of course, but that’s to be expected with games like this. Hey, at least they cram a ton of good stuff into these deals! I don’t think it’s any surprise that some people have been very vocal about the amount of in-app purchases in these games. I don’t feel Freeblade is any worse than usual, nor is it really any better. There are pretty tangible benefits to paying for these special packages, and they certainly discount them and make them seem like a real value. I think the one in this screenshot is the most expensive I’ve seen, but you also get amazing stuff, if you care for it. Personally I’d rather just forge my own equipment, but those Revive seals are nice. If you’re able to resist this kind of ad, you never have to pay a single cent for this game. I personally don’t mind tossing Pixel Toys a few bucks for creating something I enjoy very much. There’s one other negative that I really can’t speak to. I’ve heard some folks with older phones say it’s a bit glitchy or it can hang or crash. I’ve never experienced these things, but then again I have the newest iPhone right now. For me, it runs like a charm. Smooth and almost never glitches. The ads can hang, but that’s the only time it’s ever happened to me and I just close and restart. From the moment it came out I was recommending it to everyone who would listen, and after all this time playing it just about every day it’s not getting old. I’m about 3/4 through the story missions, and I’ve got a ways to go before I start maxing anything out. The short missions, variety of enemies and even the forging system still seem fun to me. You can watch (and hear) me play a level from my Twitch Stream if you want to see it for yourself, but keep in mind the resolution is much better in the game. 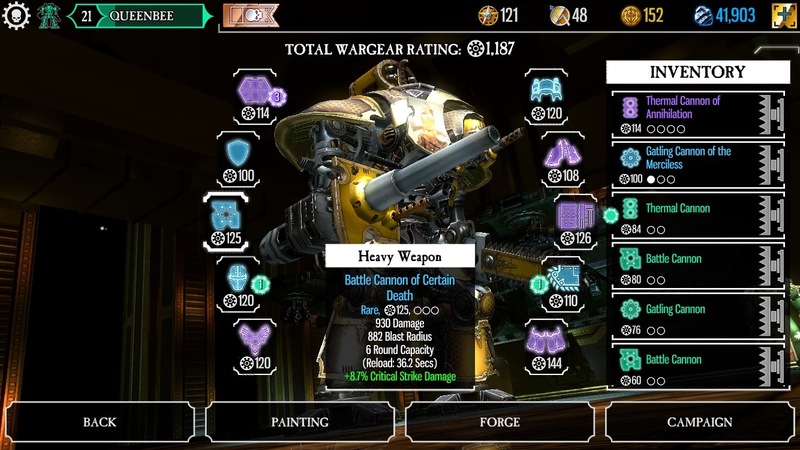 If you’re a 40K fan (since you’re reading my blog, I’m guessing you are) and happen to own an iPhone, go get this game right now. It’s free. Unlock Level 15 and take a look at my Queen Bee if you like. 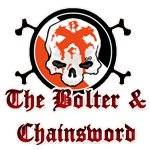 Along the way I think you’ll enjoy blasting the bejeezus out of xeno and heretic alike. 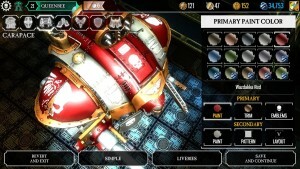 Pixel Toys has delivered a solid 40K mobile game, and the only people who seem to take issue with it simply don’t like the Freemium payment model. I get that, but as a casual gamer I haven’t found it to be a big issue at all. You don’t seem to ‘need’ to pay for anything if you have a bit of patience, and if you do choose to pay you’re well rewarded for doing so. Let me know what you think in the comments below. Unless you’re going to complain that it’s not on Android. I can’t help you there.